EGG-Stravaganza: 1 to 3 p.m., Calvary Chapel of Praise, 1601 Rebecca Drive., Lima. Egg hunt, entertainment, prizes. 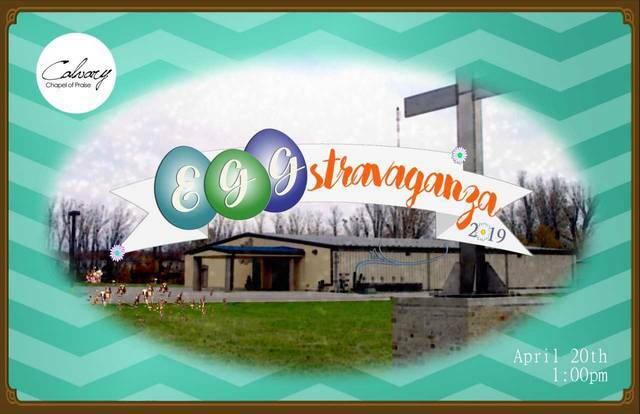 LIMA — Calvary Chapel of Praise will host EGG-Stravaganza 2019 from 1 to 3 p.m. Saturday, April 20, at the church, 1601 Rebecca Drive., Lima. The event includes an egg hunt, sack lunch, a live show and prizes. Open to ages 1-12. The event will take place rain or shine. This entry was tagged 042019. Bookmark the permalink.